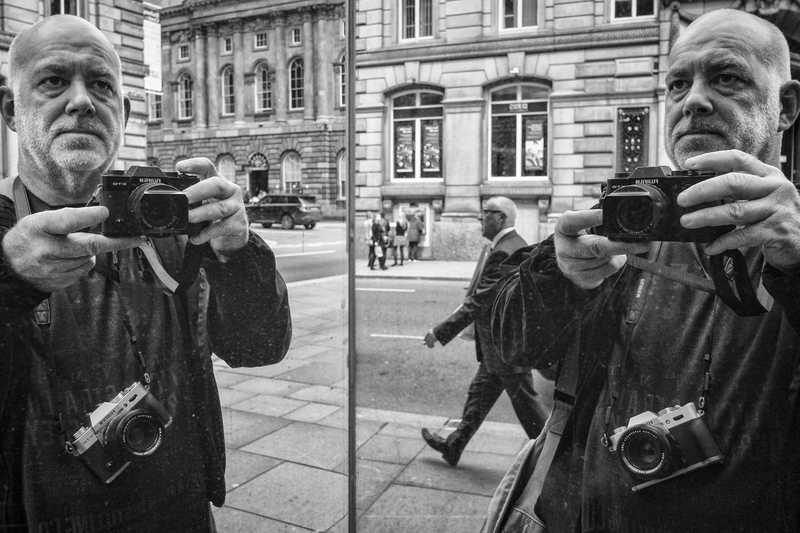 Today I decided to have a few hours in Liverpool out on the streets to see what I could find. 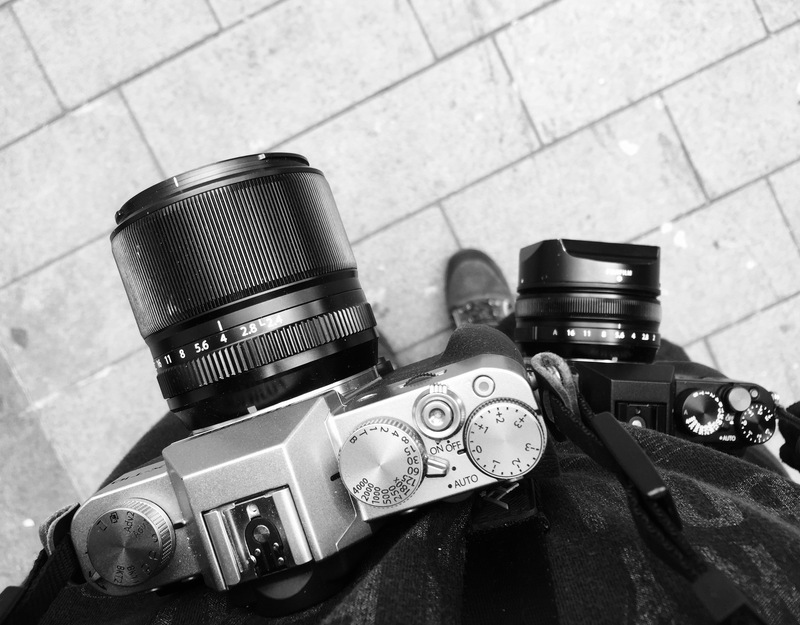 I went out with a pair of Fujifilm X-T10s, is the first time I have been out with a pair of matching cameras for quite a while. I had to decide on what lenses to take as I have had the 35mm f/1.4 bolted to my X-T1 for ages but I wanted to go wider. I did put the 16mm f/1.4 on to start with but I decided I wanted something smaller and lighter on the X-T10 so went for the 18mm f/2 for one body and the 60mm F/2.4 for the other body. I don’t think the 60mm has as much reach as I need so can’t wait to get my hands on the new 90mm f/2. The weather forecast was for an over cast day with sunny intervals, so quite promising. I jumped on the train and arrived in to Liverpool a little earlier than normal, it’s great to try different times of day but Liverpool does take its time to wake up. There were not too many people about and the light was flat never a great start. The good news was the weight of two X-T1s around my neck was nothing compared to the days I used to shoot with a DSLR with the same quality glass. I used to shoot with a pair of Nikon Fm2’s and this brought back memories, one of the street performers even shouted out “hay mate, shooting film” Just goes to show it was not just me thinking how small they were. Some days I like to cover a lot of ground when shooting Street others I like to find great spot or road and stick to one area, today I decided to cover lots of ground and see what I can see. The flat light was very uninspiring today so covering lots of ground I could look out for something interesting, but as with quite a few Street days I was not having much luck. 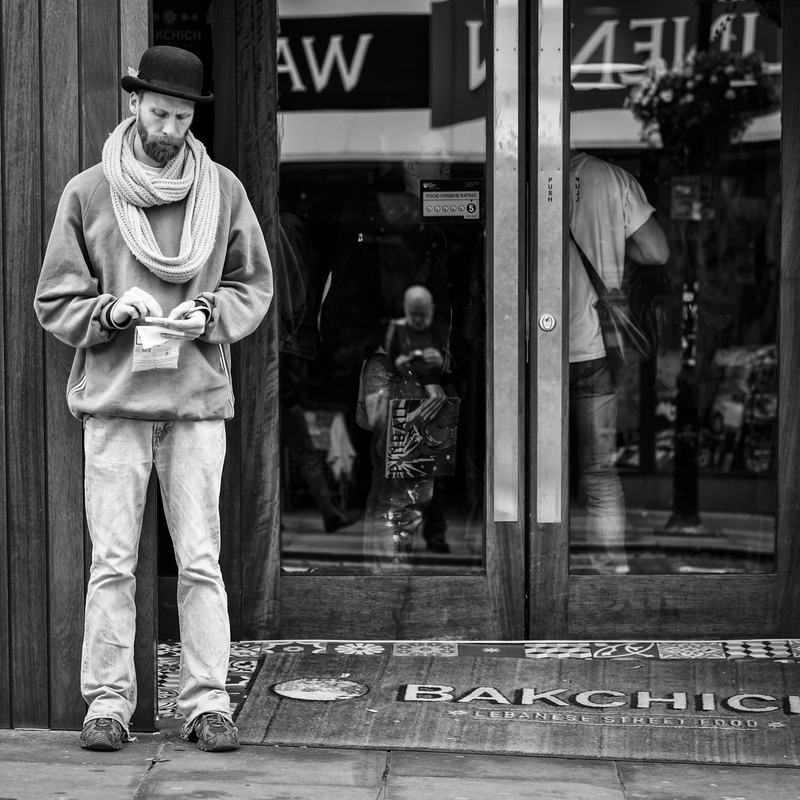 I guess Street photography is quite like fishing; you wait and wait just for that one moment. Not that I was waiting today I was on a mission. 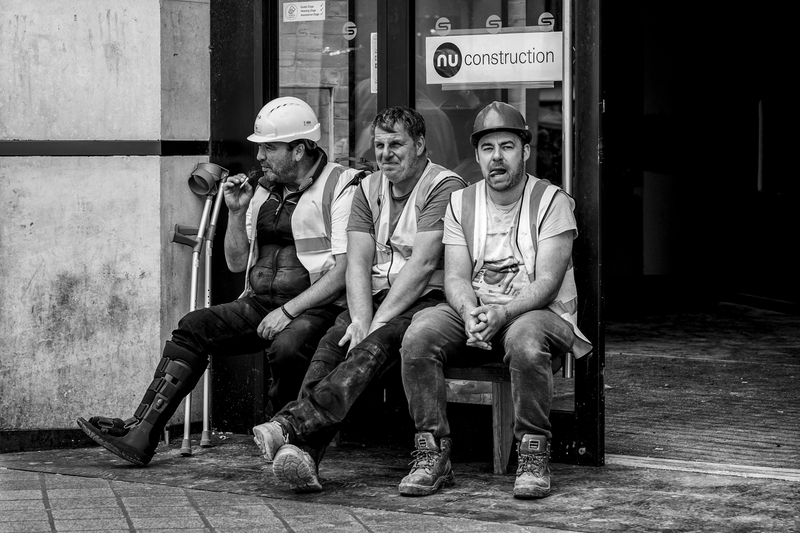 Street Photography can be hard work on some days and this was one of those days, School holidays are always quite difficult times in Liverpool not many great characters about because the Uni’s are shut and lots of people shopping. I suppose when nothing is working, it’s looking for that one great image a year that keeps me going! 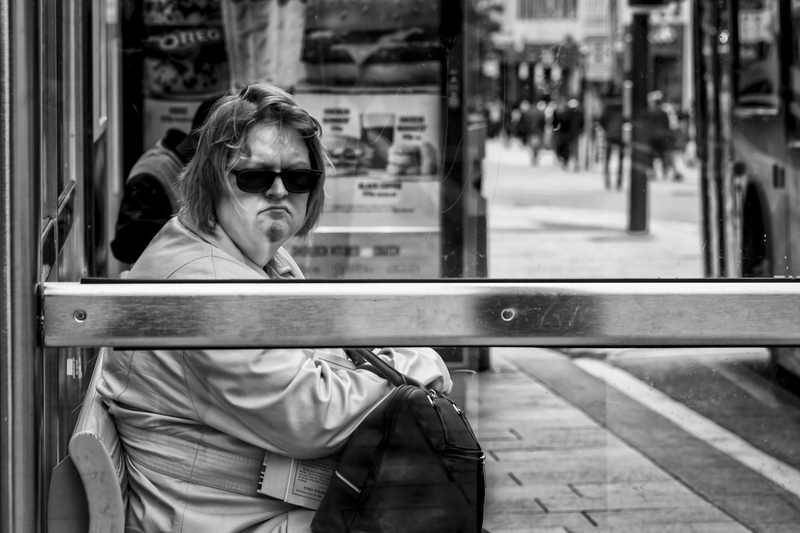 Some Street Photographers shoot prolifically and then look for something special in the edit. I have lots of ideas in my head but also look for those special one in a million moments that happen in a fraction of a second. 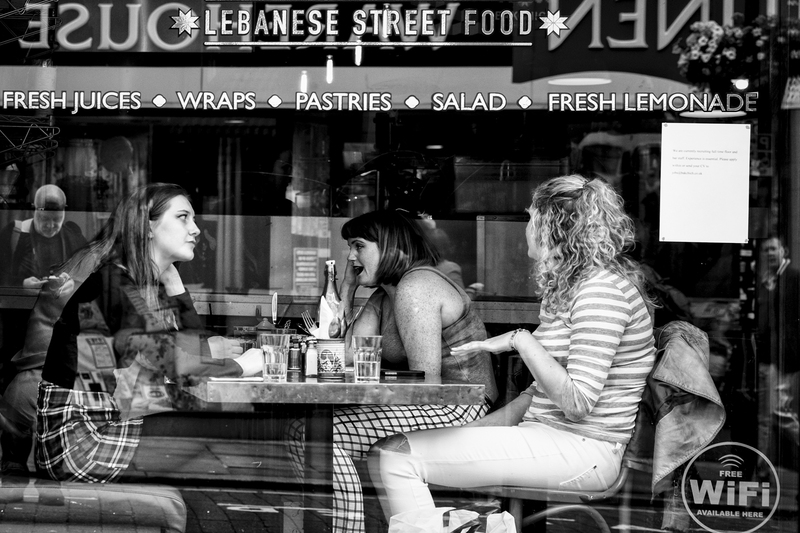 Some amazing things happen out on the street in the space of a few seconds and in an almost set sequence that will probably never happen in the same place ever again , it’s being there to capture that moment that is exciting. 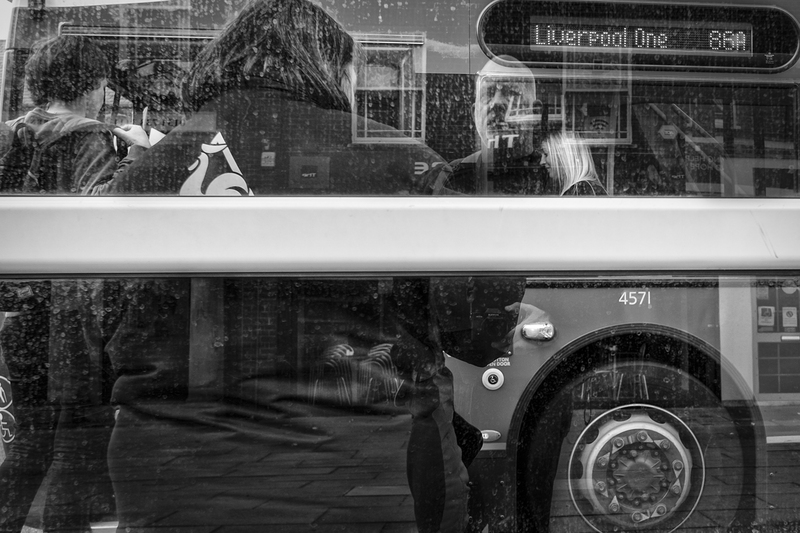 You can go for day’s, months or years and nothing great ever happens, I guess that’s why most of the great Street Photographers have had a lifetime of shooting. One thing is for sure it clocks up your daily step count. I hit 10,000 steps in no time, three miles come and go and you forget to eat and drink, I might have to market this as the Street Diet. I clocked up about 27,000 steps today and covered quite a bit of ground, but there was not a lot going on and the light was flat as a pancake. So I called it a day and got the train home. Shooting with the 60mm and 18mm on a pair of X-T10s was a breeze, once I had them set up to my preferred settings, I could just concentrate on shooting without thinking. This did take a while as I was trying out the new Focus settings and in the end decided to set both cameras to Zone Focus large Square, I set them to Aperture Priority for the day with Auto ISO and moved the Aperture for my desired depth of field depending on my subject. Auto ISO settings I used Default Sensitivity 200 Max. Sensitivity 6400 and Min. Shutter Speed I set to 1/125 sec on the 18mm and 1/250 sec on the 60mm. I am quite a calculated person when shooting and will let lots and lots of shots go if they have no set place in my workflow. I try to shoot to get in a rhythm so shoot more than I did with film but I still don’t shoot a lot of images when out. I guess one reason is I just don’t like to spend so much time looking through them all at the edit stage. I think I am very calculated and have systems and processes in my head but I can also step out of the box if I need to. All of my images follow quite a strict process that starts in my head, I know at the time of capture if I have got the makings of a reasonable image. When I sit down to review my day’s work I can almost go straight to the keepers. Once I do sit down I then start to make more decisions about the keepers and also decide where I might use the images. It’s always funny when I post to social media and someone makes a comment like “I would have cropped that like this” or “I would have shot that person from that angle” well good for them! I did not crop it like that because I like it the way I posted it! I like the angel I shot the image or there was no other option to get the shot, like a wall or bin in the way. This sounds harsh but I don’t care what people think, I have never had a Professional Photographer give unwanted Critique and even wrote a blog post on Critique a while back. I don’t shoot to please people as such and besides half of what I shoot now won’t be relevant until 10 -20 years’ time! I share my work because images should never stay hidden under the bed for no one to see, what people think is irrelevant. Some days I get home and delete all the images that I have shot, today feels like one of those days but I am going to share a few images. Normally these would have all been deleted, but I set out today to write my blog so will make an exception. Today was one of those days where the light was not working and you watch lots of situations build but they just come to nothing. I work the scene with my camera but when it’s not coming together I walk away, its great practice for when it does all drop in to place. Lucky for me today I needed to find create two more selfie’s for my project or I would have come away with nothing! 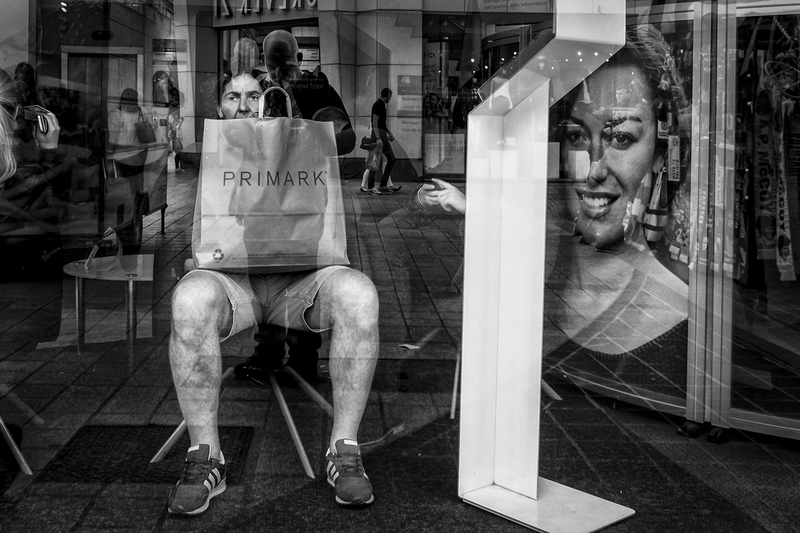 I just love to be out on the streets, not every day will bring me an image that I can use or even like and it might take me all my life to make a book of 20 great images, but that for me is the whole point. 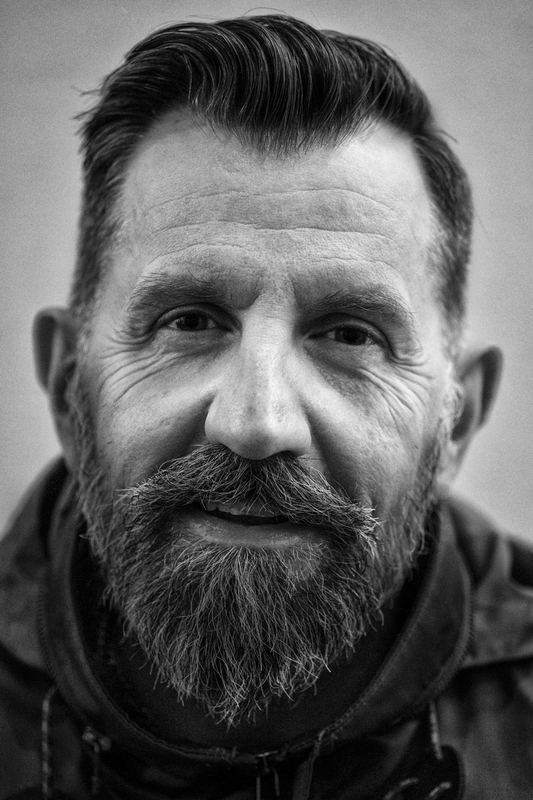 I did go for a coffee with my good friend Steve from Street Frame and even though I don’t normally shoot portraits, I had to try out the X-T10 and the 60mm lens. 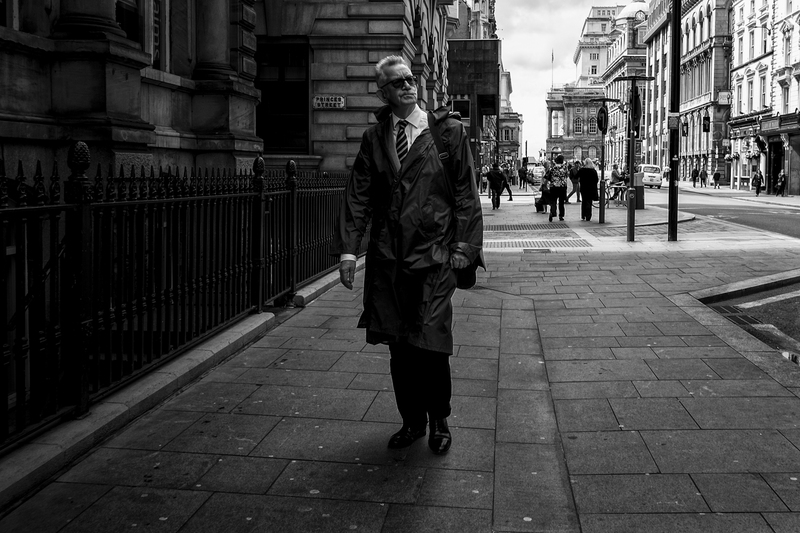 This entry was posted in Street, Street Photography and tagged 16mm, 18mm, 60mm, black and white, Fujifilm, Liverpool, Street, X-T10.